Ah, summer! It’s a time when the sun shines, when popsicles melt in the summer heat, and when the smell of grilling is in the air. That exciting scent of meat sizzling on a grill top is the epitome of summer. 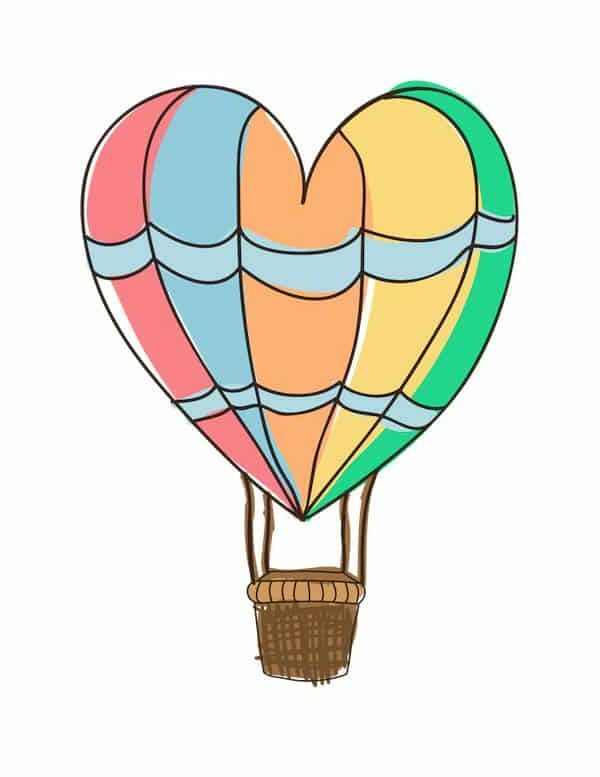 It always reminds me of the 4th of July and of summertime adventures. We recently had our own BBQ for two right on our back deck. It was a glorous New Hampshire day, and we enjoyed an utterly delectable meal, paired with the perfect beer. Our recipe? These Bacon-Wrapped Pork Chops with Black Pepper Maple Glaze from Pints and Plates. Pints and Plates is a super fun site for those who love great food and great beer. Their recipes are delicious, paired with a range of beers that match and enhance the flavors. Each recipe/pairing supports their belief that “life happens over food and beer.” We totally agree, and find savoring tasty food and well-made beer are one of the most enjoyable parts of life. 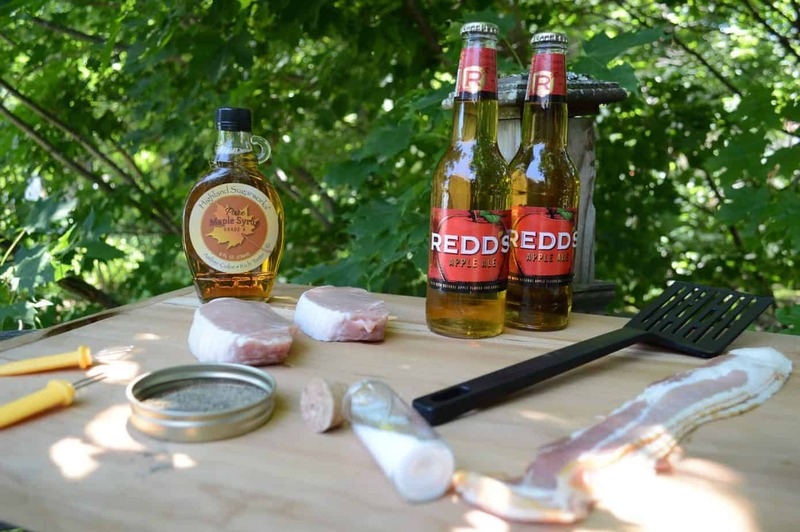 The recipe we chose to make was Bacon-Wrapped Pork Chops, paired with Redd’s Apple Ale. We’d never tried this beer before, but apple is a natural companion to pork, so we thought, hey let’s do this! We were beyond pleased with the results. This recipe is actually quite simple and straightforward. 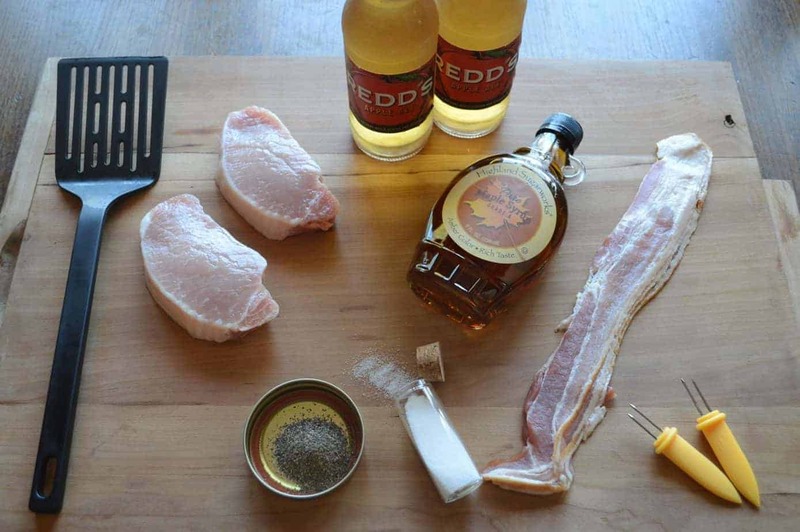 All you need are the ingredients pictured above: salt, pepper, pork chops, maple syrup, and a few cooking tools. While the recipe on Pints and Plates calls for four pork chops, we opted to half that since there were only two of us dining. Our favorite part of the recipe was the maple syrup. As we had just returned from a weekend in Vermont, we were only two happy to bring back some pure Vermont maple syrup with us! 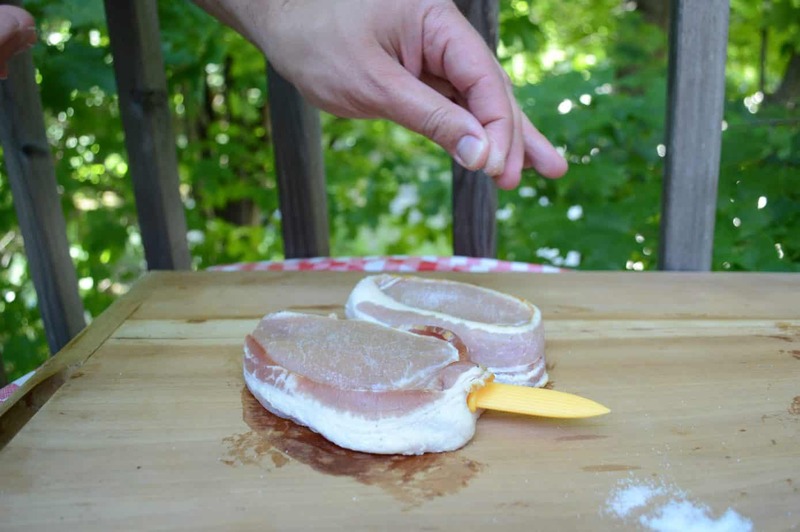 The first step is to wrap the pork chops in a slice of bacon each. 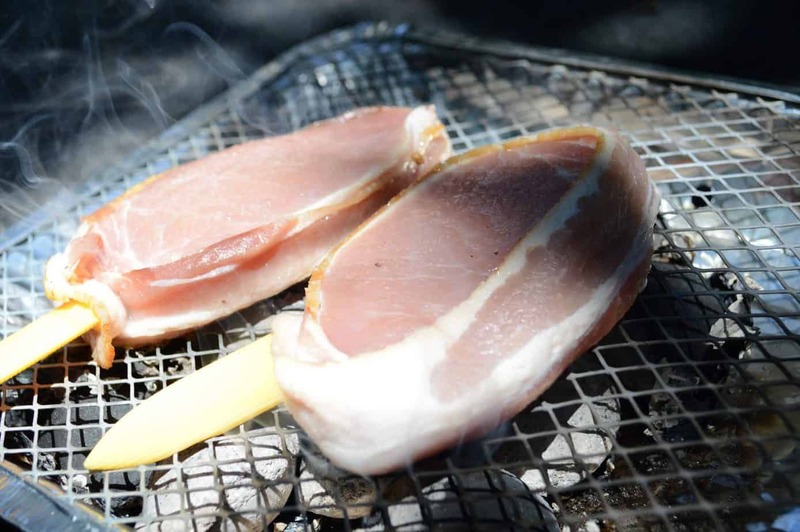 It is recommended to secure the bacon with a toothpick, but we did not have any handy, so we used corn on the cob holders instead! Got the job done. Then, it’s time to hit the grill. The pork chops cook fairly swiftly; just give them 4 minutes on each side. You’ll start to smell the tempting flavors of the grilling meat now. Oh my goodness…. 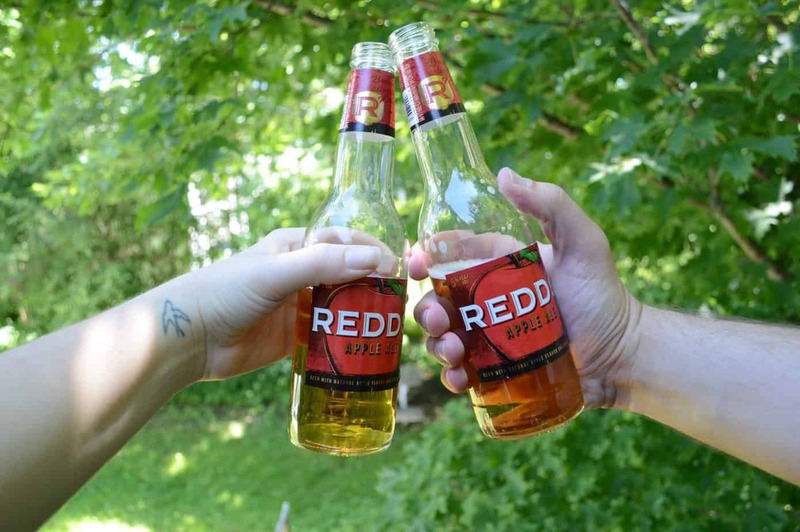 Take a break and pop open your Redd’s Apple Ale. This beer is awesome! Such a light, apple-y flavor. Absolutely perfect for summertime! After the pork chops have cooked for 4 minutes per side, it’s time to add the black pepper maple glaze. Now, you can measure this out if you want to stick closely to the recipe, but we like to play fast and loose now and again. We just went ahead and eyeballed it, pouring out a bit of syrup for each side and tossing the pepper on by hand. You can also use a brush to apply these ingredients more evenly. Side one gets the maple glaze then cooks for two minutes. Then, flip and repeat. In 2 minutes, it will be time to eat! Your dinner (or lunch) is served! 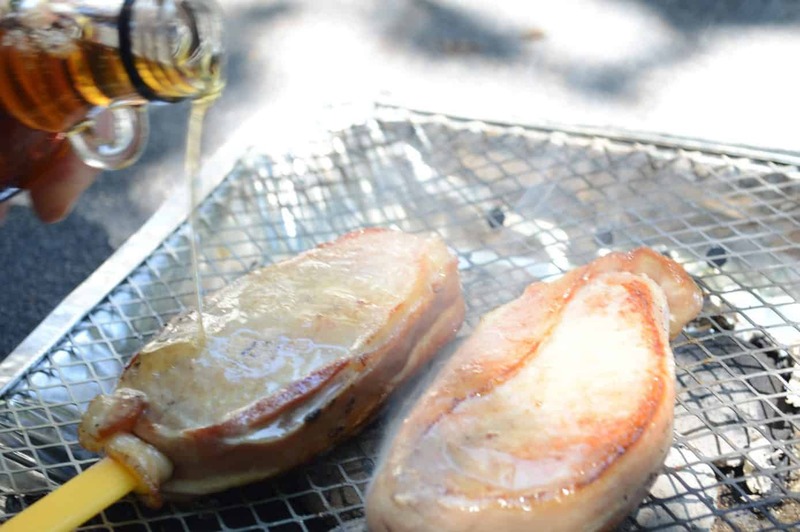 The result is a moist and tender pork chop that is bursting with flavor. And the ale brings out the subtleties of the maple and the smoky grill taste. 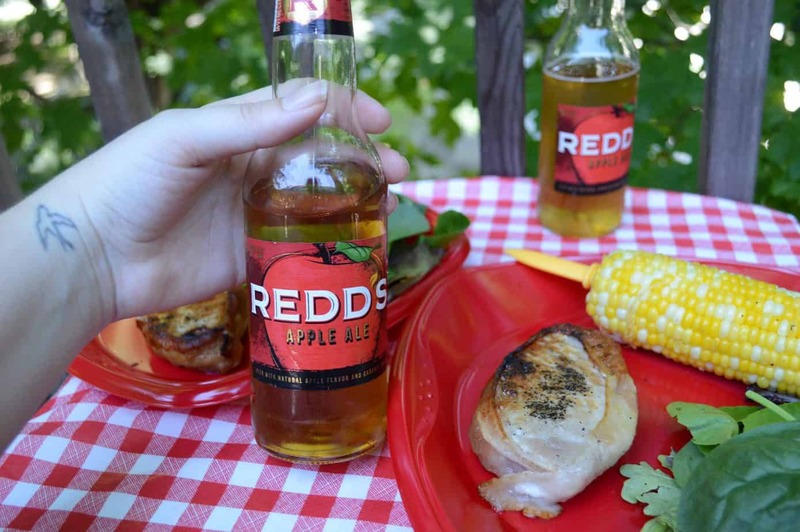 While Redd’s Apple Ale is a must for pairing with these succulent pork chops, you may also opt to incorporate some fun sides dishes. 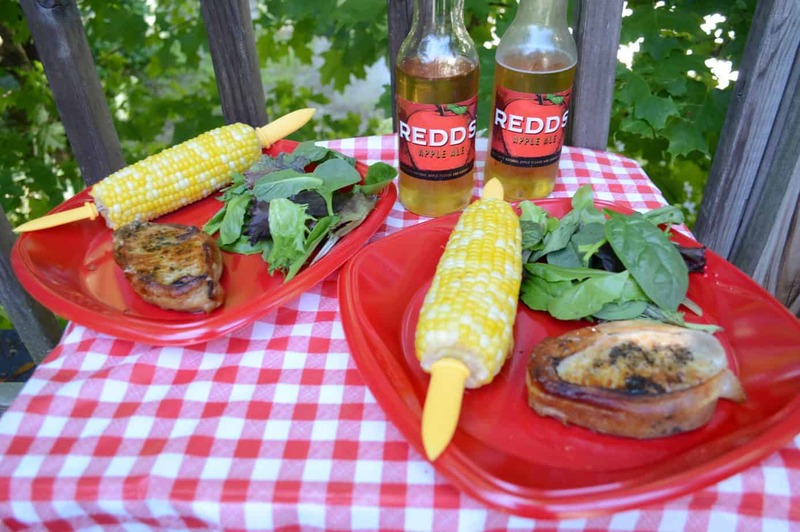 We chose a mixed green salad and corn on the cob—a summer staple. All together, this was a fantastic meal, and we regretted not making two chops apiece! 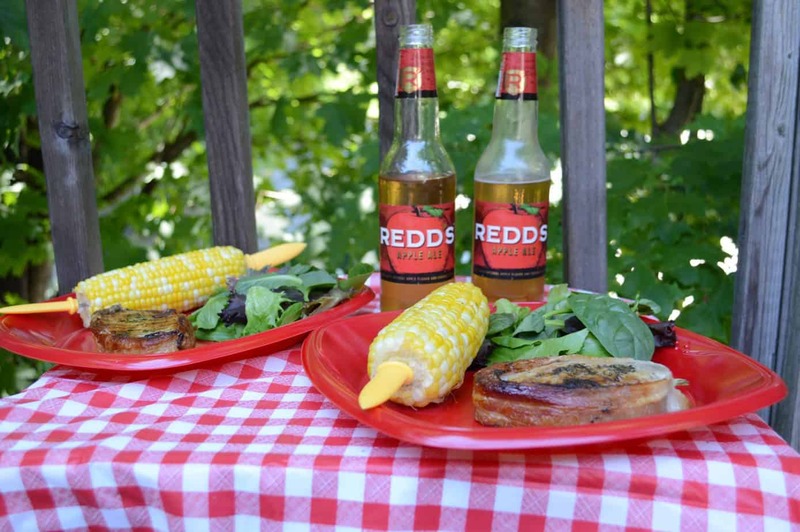 Why not check out Pints and Plates this summer as you plan your grilling menu? They’ve got some amazing recipes we’ll be adding to our list for summer and beyond. This post was sponsored by Pints and Plates. All opinions are, as always, our own.